Give mom a special gift or take her our for a gourmet meal at one our restaurants. 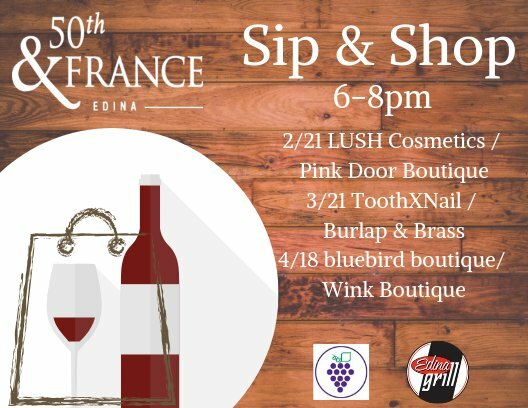 50th & France offers a variety of businesses that can make Mother's Day seamless, unique and fun! Fringe Accessories - Mothersday is everyday and should be celebrated all year, this bracelet reminders her of your love even when your actions don’t. Options for every budget and taste, giftcards too. Fringe is here to make gift giving easy. R.F. Moeller Jeweler - Shop for Mother’s Day gifts (or treat yourself!) during the John Hardy Trunk Show at R.F. Moeller on May 6th! A John Hardy stylist will be in store to introduce you to the newest pieces in the collection. bluebird boutique - Custom made diamond 14g initial necklaces. Scout & Molly's Boutique - Every woman loves a beautiful piece of jewelry, and every gift-giver loves finding the perfect gift at an amazing price! Scout and Molly’s Edina carries beautiful unique Jewelry designers that range is styles, from funky statement pieces to dainty delicates you are sure to find the perfect Mother’s Day gift. Bone Adventure - Help the fur kids celebrate their dog moms with festive frosted dog treats and other goodies at Bone Adventure. Burlap & Brass - We've got tons of ways to show & tell Mom how much you love & appreciate her! And as a lil' treat enjoy 10% off all full price merchandise this Mother's Day! (valid May 14th only). Equation - Tess + Tricia summer collection in store now! Evereve - Don’t miss the Evereve Mother’s Day sale May 14 in stores and online. Grethen House - We're celebrating all the mothers everywhere! Let Grethen House help you pick out a gift she'll love or pick up a gift card so she can pick out something for herself. Receive a free $20 gift card when you buy a $100 gift card, now through May 14! A La Mode Boutique & Nail Spa - Mother's Day Celebration May 10-17. Save $10 on any manicure and pedicure. Save $5 on Mini Mani, Mini Pedi. Grass Fed Cattle Co - The mother in the home deserves to be celebrated on her day! The Grass Fed Cattle Co has made it easy and put together a specially priced Mother’s Day gift package filled with some of our most versatile cuts. Bonus - a quick and convenient pick up at 50th and France! So gather the family around the table and show mom how much you care by cooking a delicious and nutritious meal made with locally raised, honest, 100% grass fed beef. Gift for Mom 5 Chuck Roasts, 10 lbs. Ground Beef, $175 (savings of $25.00). Limited availability! Order online at GrassFedCattleCo or by email. Lush Cosmetics - A simple "Thanks Mom" goes a long way, but a pretty box of luxurious showertime treats takes it one step further! This one contains our limited edition vanilla-lavender Pink Custard Shower Jelly, plus three more floral delights to make her morning routine blissful. With every purchase we'll donate $7.95 to our Charity Pot fund, which supports grassroots organizations that protect people, animals, and the environment. Parc - Our pick for Mother's Day is this Herbivore Botanicals Orchid Youth Preserving Facial Oil because Mom only deserves the best ingredients. Not only is it all natural but it also smells amazing and made with Camellia Flower Oil, a light weight oil that easily absorbs into the skin. Rich in skin cell renewing fatty acids Omega 3 and 6, it naturally increases skins elasticity and gives it a luminous glow. Rejuvenate Today Massage & Wellness - You ever wonder what your Mom really wants for Mother's Day? The Gift of Massage! Massage Specials include: $45 - 60 Minute Custom Aroma Massage, $85 - 2 60 Minute Custom Aroma Massages and $70 for a 90 Minute Hot Stone Massage. Gift Certificates Available. These deals end on May 14, 2017. Spalon Montage - For every $150 Spalon Montage gift card purchase, receive a $25 gift card for you. Arezzo Ristorante - Arezzo Ristorante is serving its full dinner menu and nightly specials. Complimentary glass of of prosecco for all mothers. Edina Grill - Mom's love for their families to be full and happy! This year, Edina Grill will be serving an all-you-can-eat family style brunch that will make mom's wish come true! Adults 22.95 / Kids 13.95 (Under 12). Red Cow - Red Cow will be hosting Mother's Day Brunch from 9am to 2pm on May 14th. Enjoy four unlimited courses of sweet and savory dishes. To make a reservation, call 612-767-4411. Walk-ins will be welcomed at the bar or on the patio when possible!